A big-time hero for 2007 is the expansion of Queen West’s Made You Look jewelry studio and gallery. 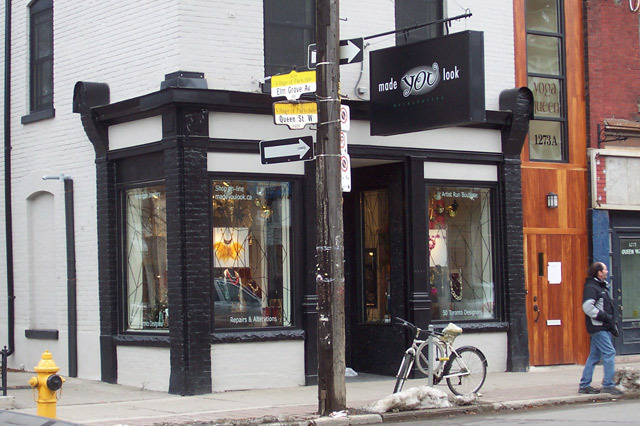 in addition to the original 1338 Queen Street West studio and retail shop, 88 Elm Grove Avenue (directly across the street) is the new home to Made You Look’s accessory shop and the Metal Arts Guild of Canada. This shop focuses on the work of local jewelry artists like the quirky and eclectic Buttercup Days, the floaty and ethereal Lorna Anderson, the colour-soaked and spunky Sailorgirl, and tons of others (who are usually around on site to answer questions about their work and are happy to take on custom projects). What differentiates this shop from other jewelry boutiques that sell handmade and one-of-a-kind pieces is their focus on artistic creativity as a process that is communal and ongoing. The strength of their vision of jewelry as art is accentuated by their recent partnership with the MAGC (who describe themselves as “a forum committed to the exchange of ideas and information, encouraging appreciation of the metal arts”). And while there are other art-focussed boutiques on Queen West, Made You Look’s staff definitely keep “artsy” and “pretentious” separate––they are approachable, friendly and actually interested in helping you. If price is an issue, they don’t snob out (and the shop also sells lots of pieces that are affordable, $40–$50ish and under). It’s great to see a place committed to artists that is also down-to-earth and comfortable spreading itself out along this stretch of street. Photo courtesy of Made You Look.